The anticipation was high, as I was eager to attend the Meals On Wheels 20th Celebrity Chef Ball this past Friday. This was a foodie’s dream event – to indulge in cuisine prepared by chefs from Chicago and around the country. The premium ticket included a four-course seated dinner served by celebrity chefs. The Indulgence Ball featured food samplings and chef stations from various Chicago restaurants. The scene was elegant and stylish and was hosted on the 7th floor by Macy’s on State St. Chefs from notable restaurants such as Perennial, Drawing Room, WAVE, C-House and Aigre Doux prepared and served signature dishes as well as desserts. Foodie favorites were the Fish Taco by C-House and Duck Croquettes delivered by Perennial. Cupcakes by Chaos Theory Cakes also got a lot of attention. Premium cocktails, casino games, raffles and a silent auction made the evening especially fun. A few local celebrities and a lot of Chicago socialites dressed for success to celebrate the grand occasion. Meals on Wheels is a non-profit organization that provides funding to programs that support home bound senior citizens and peole with disabilities. It truly is a great cause and an excellent way to give back to those that have probably helped us at one point or another during our lives. 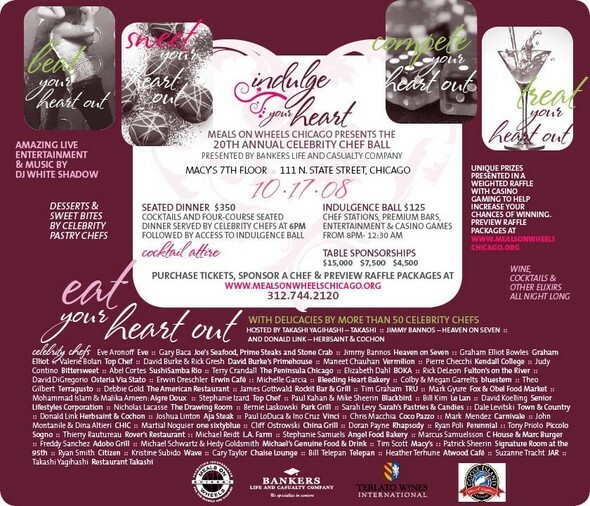 The Celebrity Chef Ball was a big hit and one of the best charitable events in Chicago. For more information about Meals on Wheels Chicago visit www.mealsonwheelschicago.org.